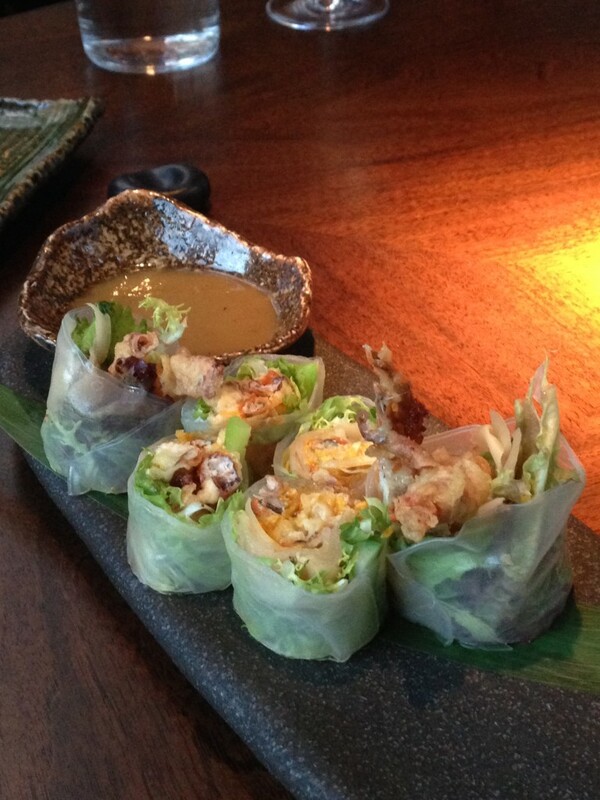 Sakagura is an upscale Japanese restaurant snugly hidden behind Burberry’s flagship store right off Piccadilly. The street-side entrance does in no way betray its interior: a glitzy post-modern izakaya with strategically positioned lighting and judiciously chosen Japanese memorabilia. The management team are from Kyoto, the original Japanese seat of the imperial court, where a high culture of luxury and sophistication has matured over one thousand years. Those influences of high culture were apparent throughout our dinner at Sakagura. 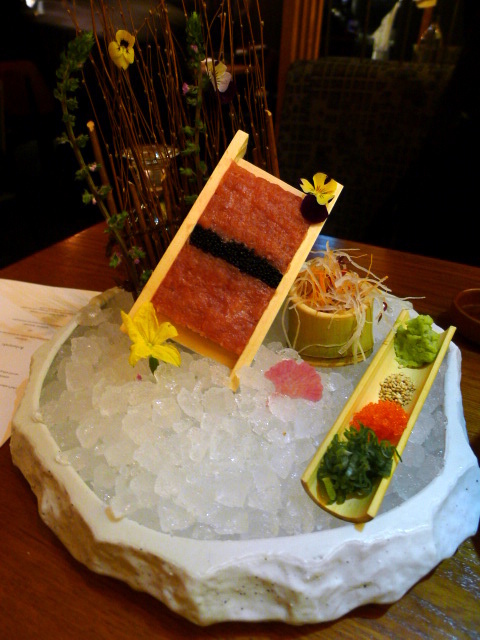 We started with maguro tartare with yuzu dip (£16) which was served on a tiny wooden tray lying on a bed of ice and decorated with multi-coloured edible flowers. There was also a layer of black capelin roe which added an exquisite visual touch as it created a contrast with the tuna’s pink. The tuna was delicious, as was the yuzu dip. The array of accompanying Japanese condiments that came along with it – wasabi, pickled ginger, toasted sesame seeds – also worked really well with the tuna. Kouzu, which means ‘composition’ in Japanese, sits in a beautiful historical 1850s Grade-II listed period building in Belgravia. Kouzu is a slick, modern affair spanning two levels, with a sushi bar on the first floor and the main dining room on the ground floor. The contemporary décor is further glamorised by a lavish set of chandeliers gracing the entrance area. Kouzu’s head chef is Kyoichi Kai who hails from Kyushu in Japan where he worked as a chef before moving to London in 1988. Chef Kai has cooked at notable restaurants such as Zuma and most recently at The Arts Club in Dover Street. 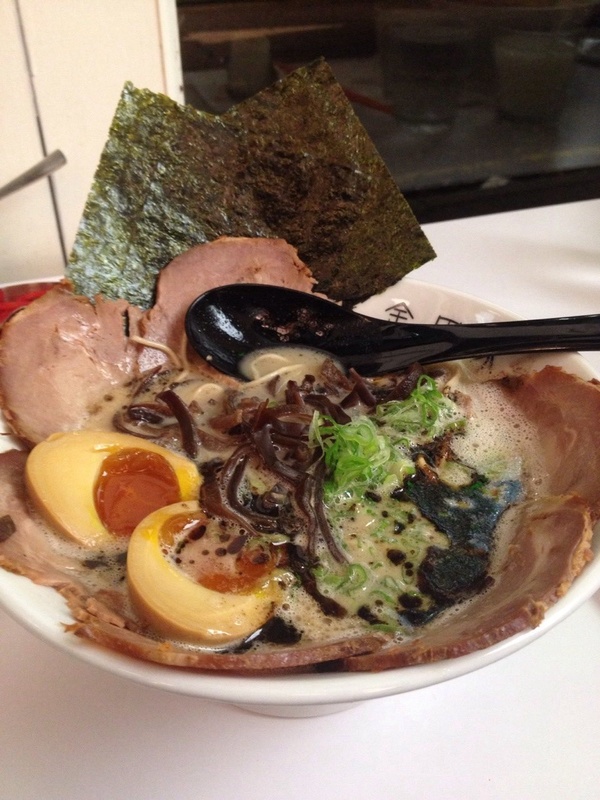 His menu includes traditional Japanese fare such as sashimi, nigiri and maki. 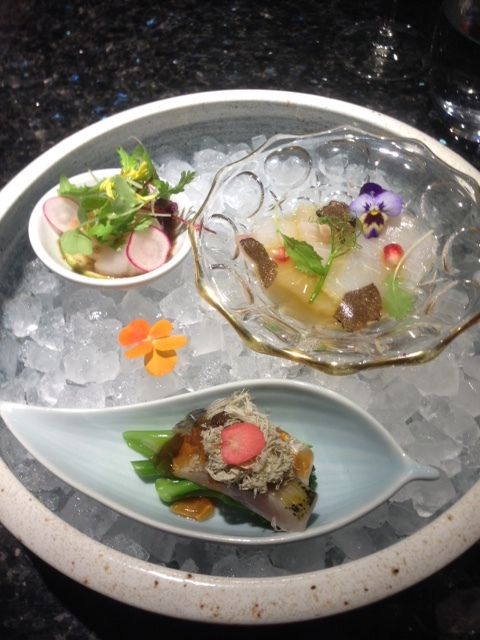 These are moderated by modern twists such as the ‘new stream’ contemporarily styled sashimi, charcoal grills, a range of tempuras, and cooked dishes such as miso-marinated black cod. On the drinks list there are a range of Japanese whiskies, cocktails, Japanese beers by the bottle and a variety of sake. 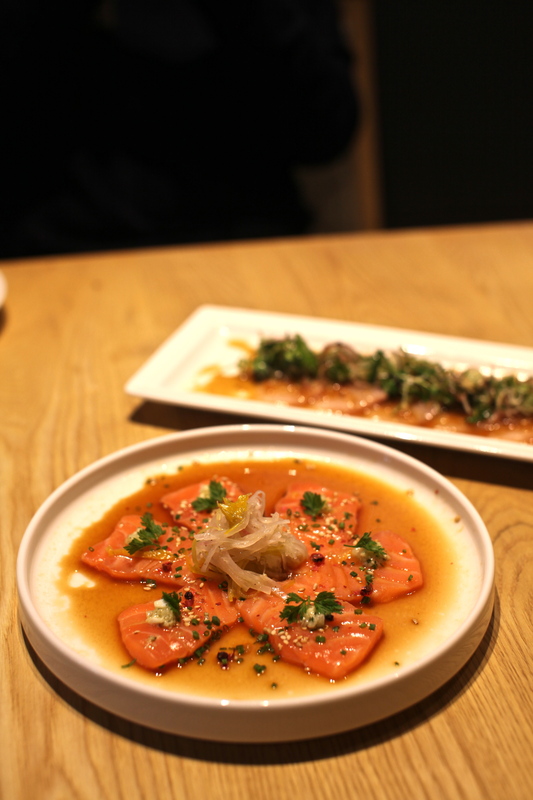 From the ‘new stream’ sashimi, the salmon with yuzu soy dressing (£11.00) was flavoursome, but the dressing of yuzu soy, ginger, garlic, and sesame seed and hot sesame oil was a little too acidic and salty and therefore slightly overpowering against the salmon. Kintan is the first yakiniku-style restaurant in London, a style of Japanese BBQ where the diner orders a selection of meat, seafood, and vegetables and barbeques the food using a grill set in the middle of the table. In Japanese the word yakiniku means ‘grilled meat’, and it is a concept similar to the better-known Korean barbecues. It is a hugely fun and interactive experience and engages everyone at the table. What’s more you also get to cook the food how you want, which in my case is medium rare for the red meats. The grills at Kintan are smokeless, so you get all the flavour of the food without having smoke in your eyes or on your clothes. It’s hot work though as the heat radiates off the grill, but it’s also a really nice way to warm the soul as we make our way into winter. 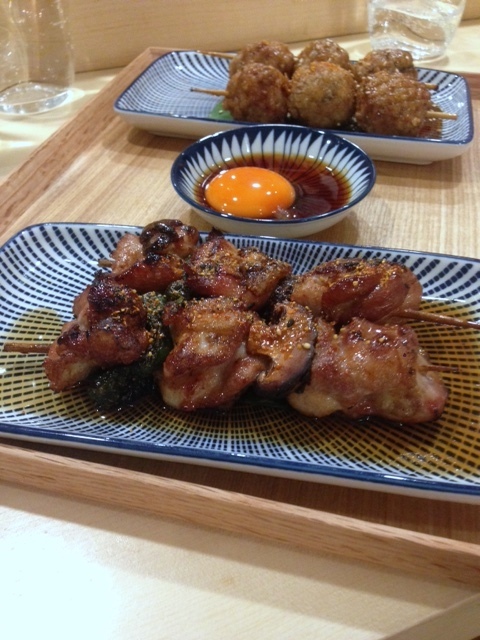 Kintan opened in July 2014 and is part of the Kintan yakiniku group of restaurants which also have branches in Hong Kong, Jakarta and Tokyo. The restaurant is very slick and modern and spaciously spans two floors. It is a very professional operation and you get the sense that the waiting staff have been well-trained to guide the diner through the menu and the finer points of yakiniku. Our grills were constantly changed as they got dirty, a service which I appreciated as there is nothing worse that getting burnt bits on your food. Although yakiniku is the specialty at Kintan, the restaurant also serves a selection of small hot dishes, salads, rice and noodles. We tried the tuna tartar volcano (£7) starter which consisted of some tuna tartar with spicy mayo served on top of a crunchy rice cracker. The tuna was delicious, especially with the creamy mayo, but it was the crunchy rice cracker that really impressed. 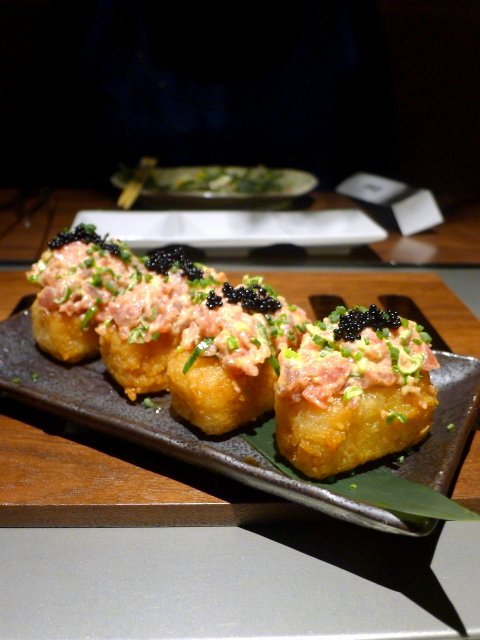 It resembled a rectangular block of rice that had been deep-fried so that it was really crunchy on the outside, thereby offering up a really interesting textural combination with the tuna.